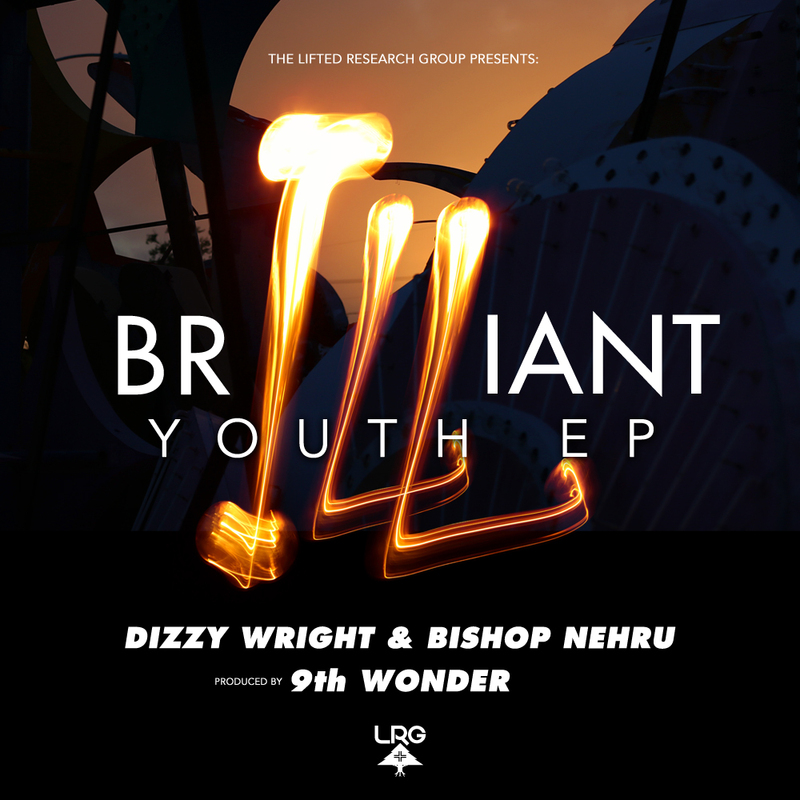 Soul-baring honesty, upliftment, and introspective thoughts of isolation are at the forefront in LRG Clothing’s 3-song EP featuring Dizzy Wright and Bishop Nehru entitled BrILLiant Youth. Featuring full production from Grammy Award-winning producer 9th Wonder, Las Vegas rapper Dizzy Wright and 17-year old New York rapper Bishop Nehru teamed up, creating the perfect trifecta to put their honesty and sentimental on display through an artistic storytelling approach. Known for effortlessly switching gears, this EP comes on the heels of two solo party anthems he just released including, “Spark Up The Flame,” which he released yesterday and LRG-sponsored video “Reunite For the Night,” which was the second official single from highly acclaimed recently released State of Mind EP. Always staying busy, Dizzy’s year has been filled with the release of two EP’s, several loosies, a handful of videos, brand affiliations with CIVIL Clothing, LRG Clothing, and Scion, and more. Catch him on his State of Mind Tour, which kicks off next week. Tour dates below. Please contact Michelle or Rory if interested in talking with Dizzy Wright. Not many 23-year old rappers can say that they’ve been rapping for over a decade. Las Vegas, Nevada, Rapper Dizzy Wright began rapping at just 8 years old, in the group “DaFuture” with his brother and very close friend; his mother wrote his raps at the time. Dizzy broke through when he was discovered at the Sheikh Music “Rip the Mic” competition in 2010 and signed onto Funk Volume a few months later. In April 2012, Dizzy released his first Funk Volume album, SmokeOut Conversations, peaking at #2 on the iTunes Hip-Hop charts. He followed it up with a free mixtape, Free SmokeOut Conversations, which has been downloaded over 200,000 times, and helped propel Dizzy to his own national 30-city tour. In December 2012, Dizzy went on to release the first of four EPs, The First Agreement, which reached as high as #2 on the iTunes Hip-Hop chart. In March of 2013, Dizzy gathered enough votes to be selected as the “People’s Choice” member of the XXL Freshman Class of 2013. Also in 2013, Dizzy released The Golden Age mixtape and followed it up with The Golden Age Tour. 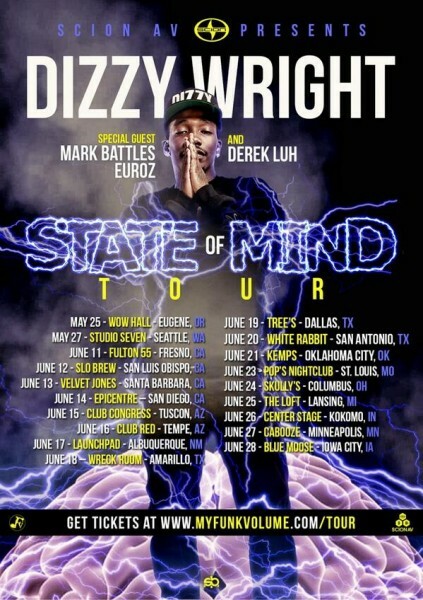 Dizzy recently released State of Mind EP and is currently touring the US with support from Scion AV.